Americans love melted cheese: on burgers, nachos, pizza, sandwiches, in fondue and queso dips. On the elegant end of the melted cheese menu is a gratin (grah-TAH, although Americans say GRAH-tin), a casserole that is topped with seasoned breadcrumbs and cheese, which is browned. Potatoes au gratin is a popular rendition, but your favorite vegetables can be given the same treatment*. If family members won’t eat their broccoli, cauliflower, eggplant, green beans, spinach, etc. Our mother was very fond of tomatoes au gratin, when she needed a tomato fix during the winter season. She also preferred onions au gratin to creamed onions for the melty cheese. Both dishes use thinly-sliced potatoes, and people often use the terms interchangeably. We have seen this error in major online recipe databases, like All Recipes. And even earlier cooks used what today would be incorrect terminology. Gratin Dauphinois, a French dish of sliced potatoes baked in cream, has no cheese or crumbs. 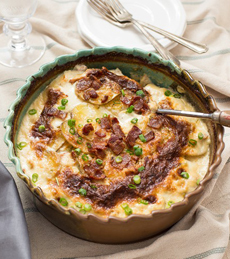 Scalloped potatoes (photo #2) use milk or cream instead of cheese. Why are they called scalloped? The leading explanation is that when the sliced potatoes were layered in the dish, the edges of semi-circles created a “scalloped” effect, as the term is used in dress- and furniture-making. Potatoes au Gratin (photo #1) refers to any dish that is topped with cheese and/or bread crumbs. The potatoes are layered with bits of butter and cream, and the casserole is baked until brown and crispy. The cheese can be melted and the crust formed in an oven, under the grill or with a salamander. Both dishes can use russets or Yukon Golds, but the latter hold their shape much better and make better-sized slices. Gratin recipes originated in Europe, possibly in Provence, which once used the word gratoneya to a certain way of cooking foods (source). Most people would think it originally came from the French word gratin, a derivative of the verb grater, to grate. But in the 16th century, that word referred to what we today call the fond, the French word for bottom, indicating food which sticks to the bottom of the pot and has to be scraped (gratte) off to be eaten. Since the 19th century the meaning has changed to indicate a crisply baked, browned top, and the term “au gratin” indicates a dish topped with grated cheese. This recipe (photo #1), from the Idaho Potato Commission, builds on the original, adding bacon, garlic and scallions. 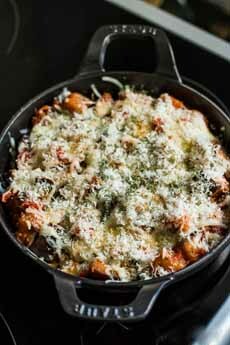 While gruyère is the classic recipe cheese, this variation uses a combination of gruyère and parmesan. Fresh herbs: chives, parsley, thyme. Mixed cheese: add blue, goat, parmesan or other favorite to the gruyère. Mixed potatoes, e.g. white and sweet (or all sweet). Mixed root vegetables: add slices of carrot, rutabaga, turnips, even beets. Seasonings: a spoon of dijon mustard or horseradish, some nutmeg. 1. PREHEAT the oven to 350°F. Generously butter 9-inch-by-13-inch casserole dish. 2. SLICE a thin layer off the head of garlic and place the bulb on a piece of foil. Drizzle with olive oil and sprinkle with salt and pepper. Fold the foil into a pouch and place on a baking sheet. Bake for 35-40 minutes, or until the cloves are soft and tender. Allow the garlic to cool long enough to handle; then squeeze out the cloves and set aside. Potatoes au gratin. The recipe, from the Idaho Potato Commission, is below. 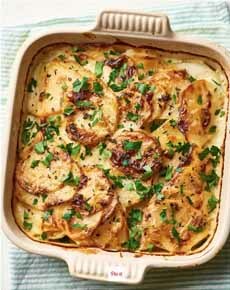 Scalloped potatoes are similar to gratin, but don’t have a cheese and breadcrumb topping. Instead, they’re made in a milk base. Here’s the recipe from The Kitchn. 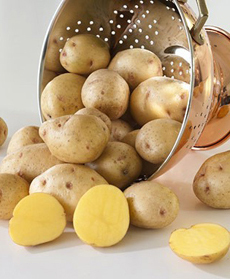 Yukon Golds, the potatoes of choice (photo courtesy Bonnie Plants). 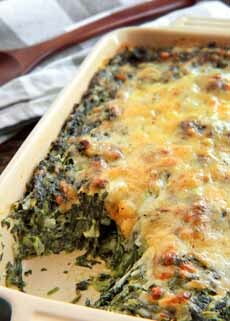 Spinach gratin, with a mix of three cheeses. Here’s the recipe from Everyday Kitchen. Eggplant gratin, with mozzarella and parmesan. Here’s the recipe from Food For Love. 3. HEAT a large sauté pan over medium heat. Add the bacon and cook, stirring occasionally, until the bacon is crispy. Using a slotted spoon, transfer the bacon to a paper towel-lined plate; set aside. 4. ADD the butter, cream, and roasted garlic to a saucepan. Heat over medium-low heat until the butter is melted. Whisk the mixture to combine all of the ingredients and break up the roasted garlic cloves. 6. TOP with approximately 2 teaspoons chives, 2 tablespoons scallions, 3 tablespoons bacon, and 2 tablespoons cheese. Repeat until all of the potatoes are used up. Top the final layer with the remaining cream, chives, scallions, bacon and cheese. 7. BAKE at 350°F uncovered for 1 hour and 15 minutes, or until the potatoes are cooked through and the top is crispy and golden brown. Serve immediately. *Some vegetables, particularly dense ones like broccoli and cauliflower, require some pre-cooking. Check a recipe, but first toss the florets and stem slices in olive oil and a bit of salt, then roast them at 425° for 15 to 20 minutes.